I asked Mr. Regan to talk about his experience at the startup. 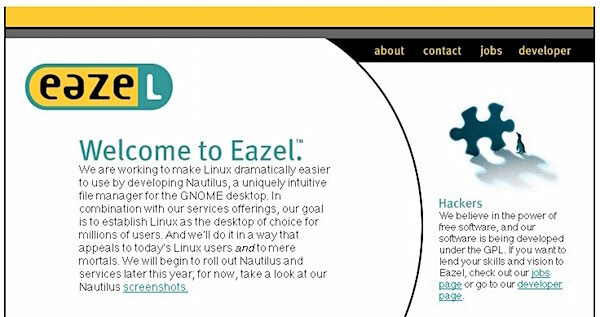 When and how did you join Eazel? I believe I was the 8th employee there. I joined right after Pavel Cisler [the very well respected programmer who has done major work on filesystems at Be, Eazel and then at Apple], who told me about the project. I initially was contributing to the gnome-vfs project and was working on URI handling. Eazel was based on a URI navigation scheme internally. I eventually ended up doing the desktop, icon view and whatever else was needed. Left to right: Andy Hertzfeld, Stan Christensen, Mike Boich, Bart Decrem. In the beginning, we all worked on everything. Eventually we started to specialize. I ended up working closely with Andy [Hertzfeld] on the desktop, icon view, sidebar and most of the elements that were exposed to the user. What I consider the “cool” stuff, although it was all cool. Did you ever use a GNU/Linux OS prior to that? Yes. I also used the BeOS and helped write parts of it as well. I have been a long-time linux user. We has some early version of it installed on some of our machines in 1995 at a video game startup I was a part of. Were you let go on May of 2001? There were two layoffs, I guess. I was at Eazel until the end, when they literally closed and locked the doors. I survived the first mass layoff and was one of the small group kept on to try and figure out some strategy to save the company. We were unable to make come up with any compelling ideas good enough to get funding in the tough climate back then. The impact of Eazel was huge, especially for Apple. Andy arranged a meeting with Steve at Apple and most of the surviving Eazel employees visited Apple. In a conference room on the 4th floor of Infinite Loop 2, we met with most of the high level managers at Apple. 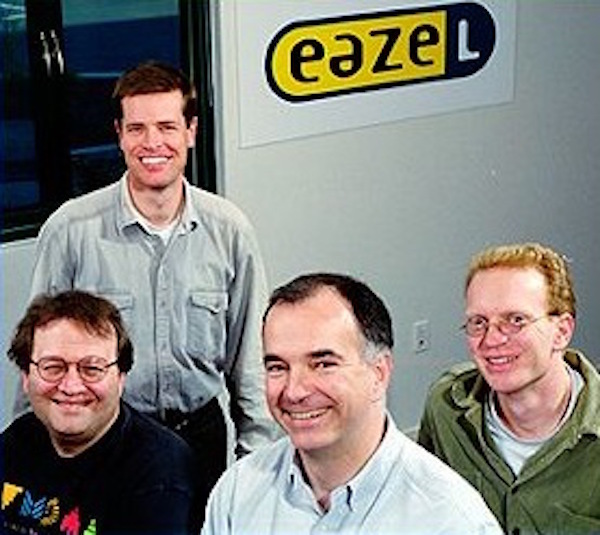 People from Eazel went on to be instrumental in creating Safari, Finder, Quartz/CoreAnimation and other cool technologies. It is very interesting to look at the intersection of Be/Eazel/NeXT employees and what technologies they ended up developing. It was fun! Is there any particularly funny or weird story you were part of or you witnessed at Apple or Eazel that you can share? I do have a really cool one about Andy and a broken Missile Command video game that I had at Eazel. At some point, Eazel out grew the space we were in and had to relocate to a larger building off of San Antonio Avenue in Mountain View. It was a really large space and we had a place in the back that we used as a kitchen and general meeting area. I had a small collection of vintage arcade games that I brought in to put there. We would take a break every now and then to play Missile Command, Galaga, Tempest and a few others. One day the graphics went bad on the Missile Command and Pavel and I did a little bit of research on what was wrong. He was originally a hardware engineer and we were able to figure out which chip had gone bad. While we were messing around with the circuit board, Andy walked by and mentioned that he had a replacement chip for the one that went bad at home and he would bring it in the next day. The next day he handed me a prototype Apple II board that had some hand wired chips on the circuit board. I felt so bad about taking apart something that I considered a piece of computer history that I ended up going to Weird Stuff in Mountain View instead and found a chip there. This type of thing was very typical of Andy; he was always willing to help someone out. Note: the Eazel website screenshot is from the Stories of Apple archive, while the Eazel people picture is from a 2000 feature on Salon.